She’s not your typical girlfriend. Recognize those lyrics dear readers? It’s from a Simple Plan song called My Alien. It’s probably one of my favourite tracks on that album. Incidentally, I was listening to their breakout album No Pads, No Helmets… Just Balls, right before I started today’s film review. And conveniently enough this song ties in very nicely with it as a transitional point. I’m gonna share a few more lyrics from the song with you dear readers before I jump in. She’s not wasting her time. That’s for damn sure. Alexander Medawar Garland, also known as Alex, is first and foremost a novelist, then a screenwriter, followed by producer and now director. Garland has been involved with the scripts for 28 Days Later, Sunshine, Never Let Me Go, and Dredd. Which if you know anything about science fiction, should get you super excited. But his breakout fame came with his first novel, The Beach. This of course was later made into the film The Beach. Ex_Machina is Garlands directorial debut. And given his record of previous projects, I just had to check out this film. Now I realize it’s a little bit late, but my policy at timotheories is always digital curating at heart, and so we curate that which is necessary. Especially since there was nothing new released last week that seemed worth the attention. And so here we are. Already released on blu-ray and digital HD a year ago, Ex_Machina is a story about a surprisingly difficult to assess turing test. This is because the detail to which the newly minted android Ava (Alicia Vikander) is capable of convincing programmer Caleb (Domhnall Gleeson) to play into her game of cat and mouse with her creator, and his employer, Nathan (Oscar Isaac). And this ultimately surprises both men. Throughout the test, Ava is confined to her apartment, within the compound of Nathan’s hidden mountainside home. Caleb is locked in as well, to protect company secrets, but Ava slowly wins Caleb over during his questioning with her flirtations and expressed attraction towards him. Her ability to cause power surges cuts the security cameras at key moments and allows her and Caleb to have frank exchanges. This leads Caleb to believe that Nathan is abusive and cruel towards Ava. Caleb eventually learns that Ava will be upgraded to a new model after the test is over, which will destroy her consciousness and memories. Caleb and Ava plot to overthrow Nathan and escape the facility together. It is only in the final moments of Caleb’s stay before the helicopter will arrive to take him back home, when Nathan reveals that he already knew all of the androids were intelligent and had consciousness, but that he wanted to know how easily a human could be manipulated by one and how far the android was willing to take it to escape. Caleb then tells Nathan he has already engineered the escape, and Nathan knocks him out. Ava is now out and works with the only other android to kill Nathan. Ava goes into Nathan’s room to repair herself using old android body parts and skin, becoming indistinguishable from a woman. She then leaves Caleb locked in the facility, now conscious himself and watching the scene unfold, taking the helicopter meant for him. Pros: With such a small cast, we are really given the time to digest the unfolding story and enjoy the clean and concise results. Amazingly it is a film of ideas, dressed beautifully with carefully and sparing CGI. Cons: The voyeuristic elements which are useful in demonstrating the flaws of both Nathan and Caleb kick into full gear right at the gut punch, and make it a little less thrilling. Points of Interest: Oscar Isaac based his character on intellectuals with dark sides, namely Bobby Fischer and Stanley Kubrick. Throughout the film the colours red, blue and green are used very obviously in each area of the house, a nod to RGB colours which are used for computers. 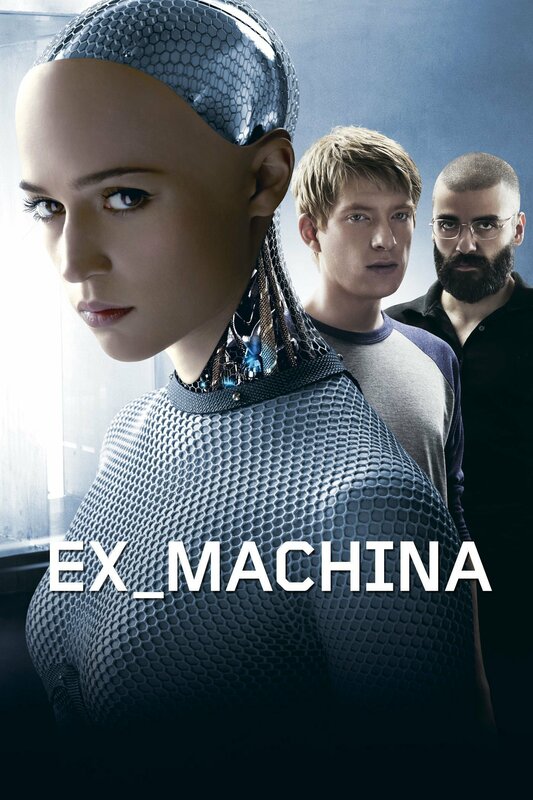 Ex_Machina just might be the scariest science fiction movie I’ve seen in some time. Throughout the film I was never clear on the true intentions of each character, and that in itself was an excellent turing test. At the end of it all, I have to wonder if Ava had planned to use Caleb all along or if he eventually offended her in some way or another. And that my friends, is why this is an excellent film. And if you want further evidence, please check out the video review below! Swedish actor Alicia Vikander has an incredible range, and just the right mix of emotions portrayed to demonstrate the naïveté of an AI not yet realized. That surface tension is what draws us in, and makes us question the morality of the human characters, and maybe even sympathize with Ava. She’s not your typical girlfriend indeed.